In this tour de force on the most important issue of our time, David Horowitz con­fronts the paradox of how so many Americans, including the leadership of the Dem­ocratic Party, could turn against the War on Terror in Iraq. He finds an answer in a political Left that shares a view of America as the “Great Satan” with America’s radi­cal Islamic enemies. This Left, which once made common cause with Communists, has now joined forces with radical Islam in attacking America’s defenses at home and its policies abroad. From their positions of influence in the university and media cul­ture, leftists have defined America as the “root cause” of the attacks against it. In a re­markable exploration of the “Mind of the Left,” Horowitz traces the evolution of American radicalism from its Communist past to its “anti-war” present. He then shows how this Left was able to turn the Democratic Party presidential campaign around and reshape its views on the War on Terror. 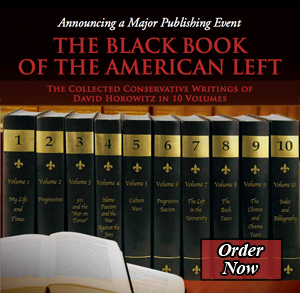 David Horowitz speaks to the Georgetown University College Republicans on October 14, 2004, on his book Unholy Alliance: Radical Islam and the American Left.